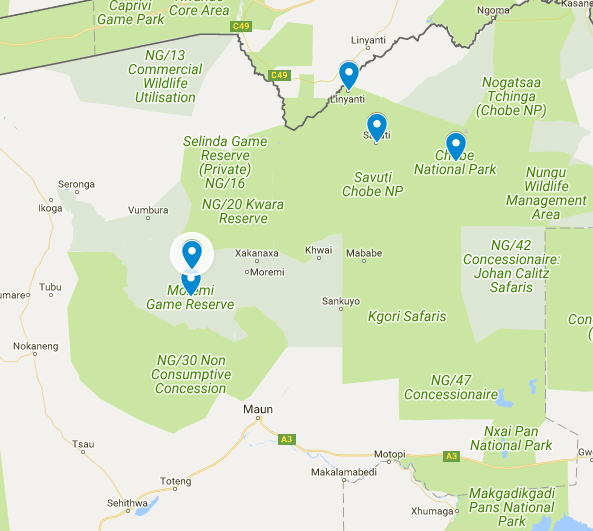 We will meet in Kasane, Botswana and depart for our campsite in Chobe National Park straight away. Our campsite for the next two nights is situated on the banks of the Chobe River in the middle of the park. Chobe is famous for the large number of animals that congregate here in the dry season once the open water has dried up. Besides the hippo and crocodiles that are always around we should see massive numbers of zebra. Chobe also has the highest elephant population in the world and the area has some big lion prides. We will continue our safari with a slow game drive as we make our way through Chobe towards the Linyanti River where we will camp for the next two nights. This remote area of northern Botswana is one of the true wilderness areas in Southern Africa with plenty of game and not a lot of people. The Linyanti River also attracts large numbers of game in the dry season. The area is known for the large number of elephant and the frequently seen predators. We will slowly make our way down through some beautiful mature Mopane woodland towards the Savute area where we will camp for the next two nights. The Savute area is well documented as being one of the best places for lion sightings with a number of very big lion prides around. Hyenas and elephants are also present in large numbers. The campsite is known for lions, hyenas and honey badgers visiting at night. Leopard and cheetah are also often seen in the Savute area. We will spend the last three days of the main part of the safari in the world famous Moremi Game Reserve which forms part of the Okavango Delta. Due to the variety of habitats we will spend three nights here to enable us to explore this area properly. Moremi is well known for large diversity of game and birdlife and lion, leopard, hyena, cheetah and wild dog are present in good numbers. Other game present in the area include elephant, buffalo, lechwe, impala, sitatunga, waterbuck, sable, roan, kudu and warthog. After a leisurely breakfast we will make our way to Maun for your flight home or continue our safari with one of our safari extensions. Why not continue the safari with an additional 3 nights in a Makgadikgadi and/or Nxai Pan National Parks. Known for the huge salt pans the habitat in these parks are completely different to what we have experienced thus far on this safari. Game is attracted to the waterholes and it is not uncommon to see big herds congregating around in the dry season. The Central Kalahari is another one of the remote wildlife wilderness areas of Botswana. Dry acacia savannah dominate the landscape with big herds of plains game like zebra, oryx, springbok, red hartebeest and blue wildebeest present followed by the big cats: lion, leopard and cheetah.